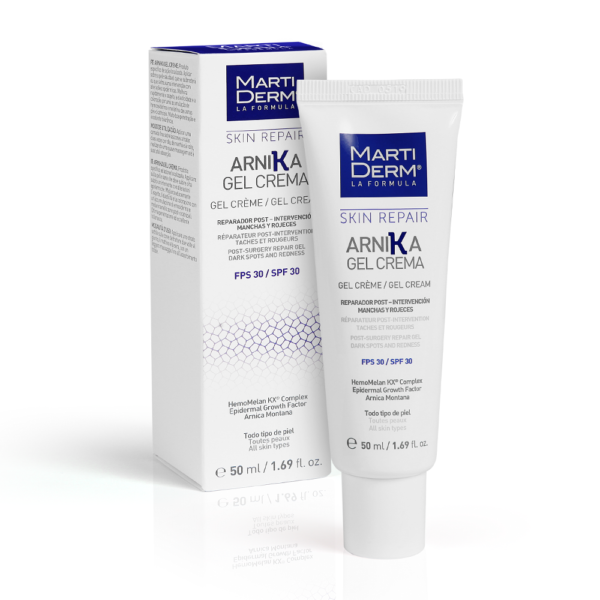 Repairing gel for the face and body. Improves the appearance, elasticity and colour (haematomas) of post-surgical scar areas. Reduces and diminishes couperose and prevents the redness associated with cosmetic procedures. Improves the appearance, elasticity and discolouring of post−surgical scar areas. Specific sun protection for couperosis and rosacea. Specific treatment for dark circles. Apply a fine layer of the gel onto the area to be treated twice a day, morning and night, massaging gently until fully absorbed. It must always be applied before any other cosmetic products, onto dry and clean skin. It is recommended that the gel be used 10 days before surgical event and that the treatment continue for two weeks after the event, applying it twice a day.